How you pack and clean your fridge can help keep your food safe. Pop quiz: When’s the last time you cleaned out your fridge? If it was more than a month ago (we know, us too), read on. 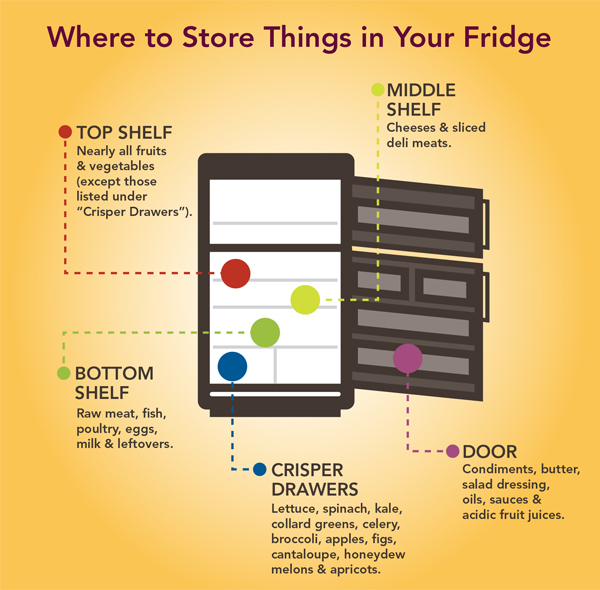 Nutrition Action, the newsletter published by the nonprofit Center for Science in the Public Interest, has created a refrigerator-cleaning primer to help you keep your food safe from harmful bacteria. To clean your fridge (every month! ), use paper towels, hot water, and dish soap. Be sure to wipe everything down thoroughly—interior walls, shelves, and especially the bins that hold produce and deli meats and cheeses. For extra sanitizing, make a solution of 1 tsp. unscented bleach to 1 quart of water, and use it to wipe down all the surfaces in the fridge. Dry with paper towels. Keep foods that can support bacterial growth (like eggs) in the coldest part of the fridge: the back. Items that are less sensitive, like condiments, can live on the doors, where there is more temperature fluctuation. Don’t overstuff your refrigerator. Doing so keeps cold air from circulating around your food. The best time for a thorough fridge cleaning? When your refrigerator has the fewest items in it, like right before a big shopping trip. Come home from the supermarket (with a cart full of healthy food, of course) to a sparkling-clean refrigerator, then unpack wisely.